An Interim Budget 2019 has been presented by acting Finance Minister Mr. Piyush Goyal this time. The Interim Budget is very similar to the full budget it gives a complete set of account including both income and expenditure for the full year. As Lok Sabha Elections is just a few months away, the ongoing government presented Interim Budget, not a vote on the account the later one deals only expenditure side. There were lots of hopes and expectations from Interim Budget 2019. It was anticipated that the Budget would be populist and election Budget. The Interim budget 2019 has not only favored farmers but also made happy to middle-class taxpayers, small businessman, and Industrialist. It was expected that Interim Budget 2019 will boost retail, infra, real estate, power, BFSI sectors. Based on these expectations many brokerage houses had also given calls on Budget related Picks, you can get those calls on various financial portals. 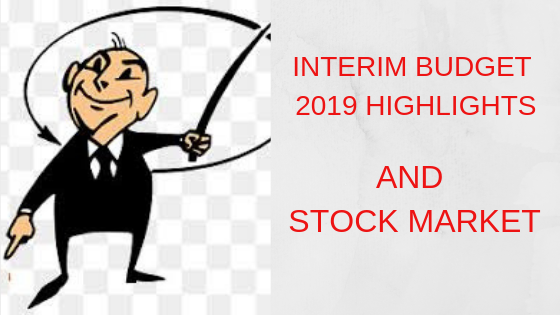 Let us now see the main highlight of the Interim Budget 2019-20 and how it is going to influence the stock market. The individual taxpayer will get Full Tax rebate up to 5 Lakh annual income after all deductions. Capital gain tax benefit has increased from investment in one residential house to two residential houses. Rs 6000 per annum has to be given to every farmer having up to 2-hectare land. This initiative is likely to benefit 12 crores small and marginal farmer at an estimated cost of Rs 75000 crores. More than 3 lakh corers for defence. 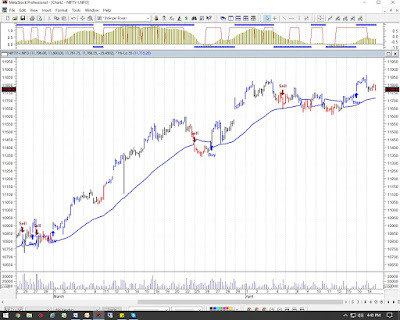 Today in the stock market, Sensex and Nifty started with a positive note in the morning. As the Interim Budget presentation started market moving towards northward directions. Stock Market has given thumbs up to the last budget of Modi government ahead of general election. In the end, the Sensex and Nifty gained more than half a percent whereas Bank Nifty fell 0.77 percent. Banking stocks remained under pressure throughout the day, profit booking was seen mainly into PSU banking sectors today. The major gainers are from the sectors of Auto, FMCG, Pharma, IT, Energy and Infra whereas the losers are mainly from Banking and Metal sectors. To conclude the Interim Budget 2019, you can say its a DREAM BUDGET of Modi Government. From the Stock Market point of view, the budget will be welcomed by investors, Sensex and Nifty both the indices closed in a positive note today. The budget has not disappointed to any sector rather it has given more than common man's expectations particularly middle class and farmers. The Budget will definitely increase the disposable income in the hands of a middle-class section. This will give a big boost to Auto, Consumer Durable, Banks and NBFC sectors. If you like the post please don't forget to share with others.